Vincent van Gogh made this painting as an excercise in painting the horse, while he was studying at Fernand Cormon’s workshop in Paris. He spent three months there in the spring of 1886. The statuette by Théodore Géricault was often used as a teaching model in workshops of painters because of the anatomy and the movement of the horse. 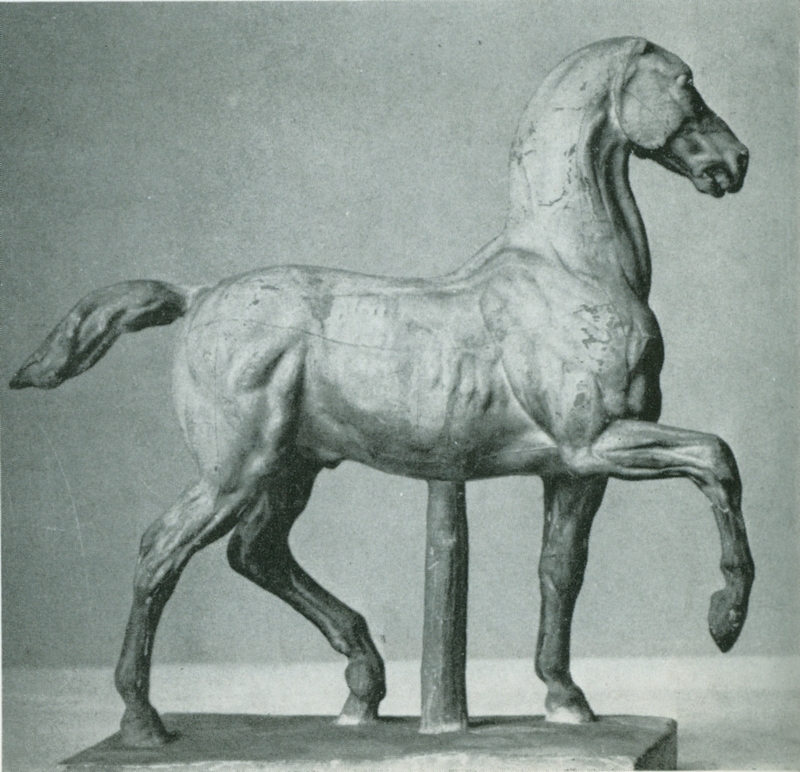 This example makes clear how important the correct rendering of the horse was for artists and it indicates the mastership of Théodore Géricault on this subject. Chris ten Bruggen Kate (1920-2003) was born in Utrecht and worked all his life as a painter in Nunspeet and Zwolle, The Netherlands. He concentrated on local landscapes and his style evolved over time into ‘magical realism’. He also painted horses and especially white horses. 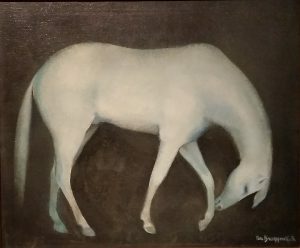 His horses are usually part of the landscape, but here the artist has given all attention to the elegant lines and delicate coat of the white horse. The posture of the animal is designed to be graceful but still natural. 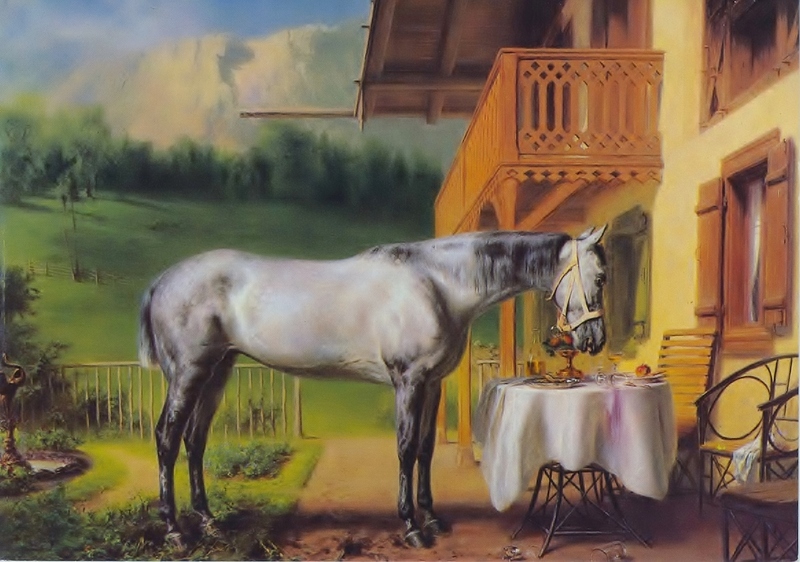 This is a horse the artist may have seen in a dream. Once he did mention a black horse in the snow he had seen in a dream. 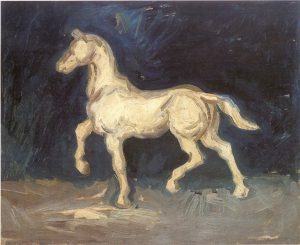 This white horse is likely to be an Arabian thoroughbred, which type is the favorite of many painters, also in modern art. In the present world where disagreements between countries and regions dominate, where tensions are being cultivated, it may be refreshing to pay attention to this magnificent monument. 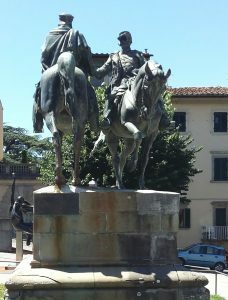 In a complicated strategy for the unification of Italy, two patriots decided to drop disagreements and to join forces in the interest of their common country. 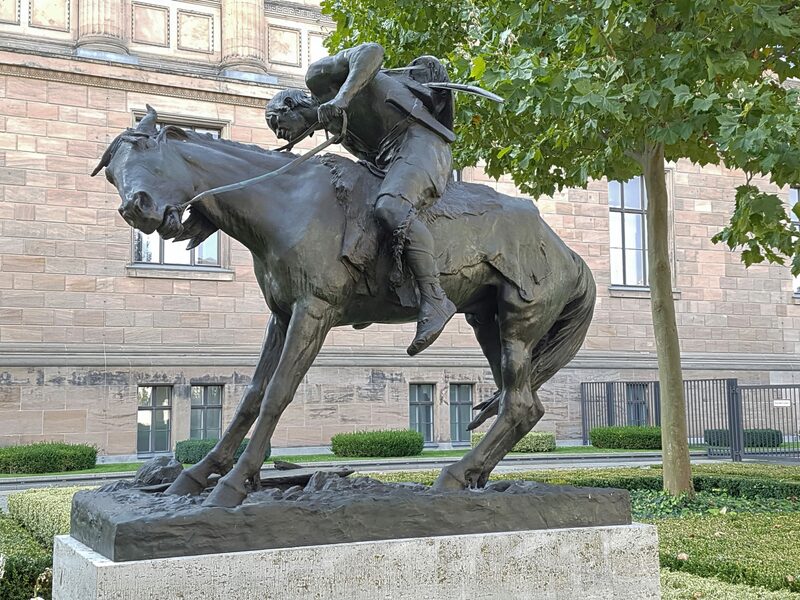 The sculptor used the position of the horses coming from two different directions to maximal theatrical effect. The riders hold out their hands to each other and so bridge the distance between them and the horses. Everything in this encounter has symbolic significance which in this way is strongly emphasized and recorded for posterity. 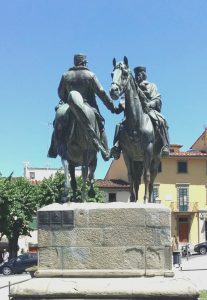 The gestures of Garibaldi and Vitorio Emanuele will also be influenced by some chivalry which historically belongs to the basis of horse riding. This attitude seems somewhat forgotten but is an important peace making tool. In summary, we see a beautiful equestrian monument with much value for the present time. This gigantic painting dominates the Gallery of 19th Century Polish Art in Kraków. The width of 6,6 meter exceeds that of most paintings in the more famous Galerie des Batailles in the Château de Versailles. The paintings in Versailles are monumental in the history of France, but this Polish painting only renders the exploit of one man, who enjoys the running of his four horses. He has chosen a four-in-hand team, harnessed next to each other, like a Roman quadriga. It is not a race against competitors, only a race for individual pleasure. 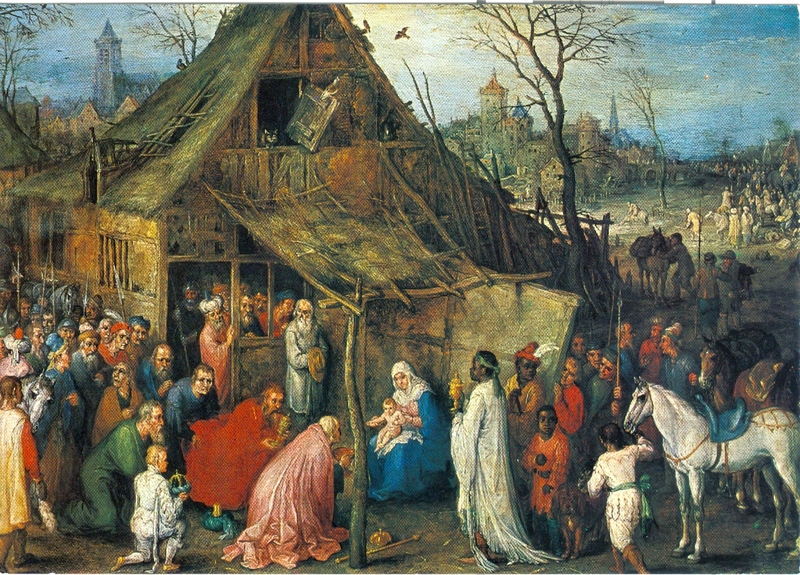 The whole painting is designed to impress the viewer with speed and action. The frontal point of view on the level of the horses’ noses makes that the viewer becomes scary. The harness of the horses is decorated with small shiny ornaments and the big round buckles are markers of the movement. 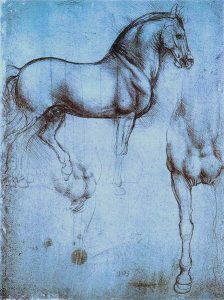 Another important aspect of this painting is the position of the horses’ legs. In 1881 the stereotype position with stretched legs in the flying gallop was still common. Chelmoński, however, did not use the stereotype rendering, but applies a new position with one or two legs bent over. This posture is not correct either (the scientific proof of the real movements dates from 1874), but very suitable to give the impression of extreme action and speed, better than the conventional stretched legs. 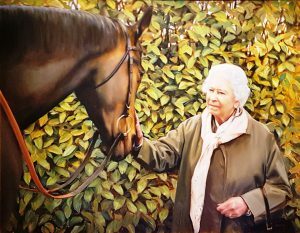 Here the artist has added a new feature to the possibilities of the horse painter. 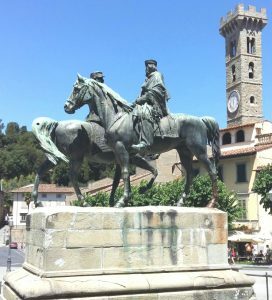 The Sforza monument was never realized by Leonardo but a model did exist before it was destroyed by French troops in Milan in 1499. During 1988-1996 the Americans Charles Dent and Garth Herrick produced a model according to Leonardo’s design and specifications, but in the foundry it could not be executed. Then the American sculptress Nina Akamu was asked to solve the problems. She concluded that with Leonardo’s specifications the statue could not be realized. 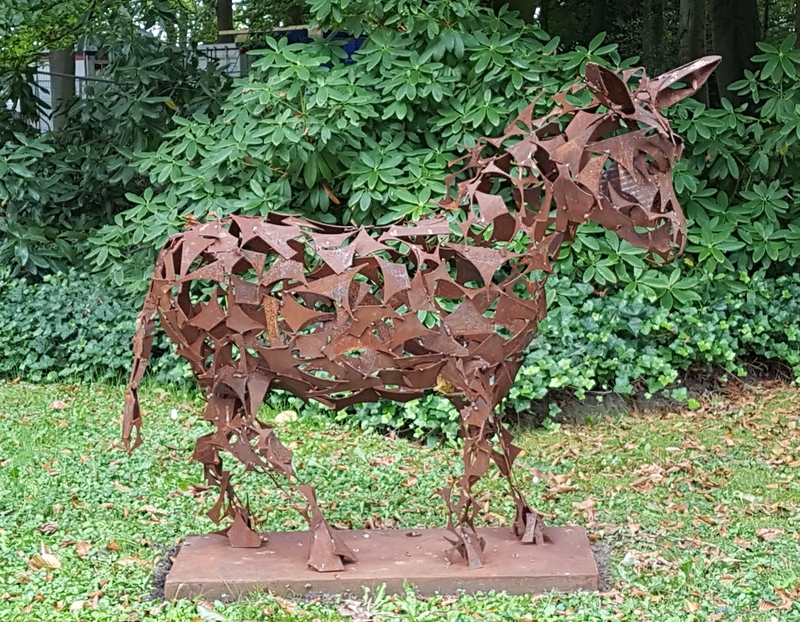 Nina Akamu adapted the design, made a new model and Tallix Art Foundry realized the present impressive statue of 7,30 meter high in 1999. 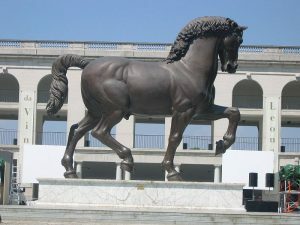 A copy with the same height is in Frederik Meijer Gardens and Sculpture Park in Grand Rapids MI, however with the title ‘The American Horse’. Nina Akamu considers her work as a tribute to Leonardo da Vinci (Paul Liebermann in Los Angeles Times, 25 June 1999).